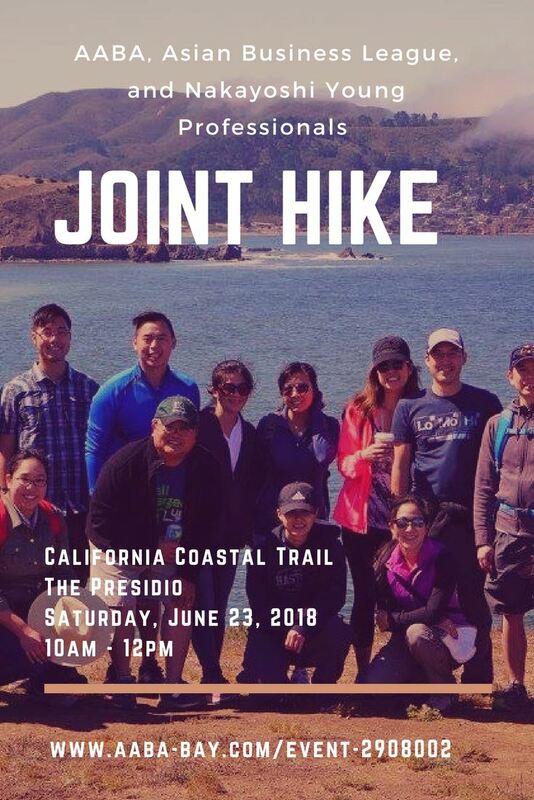 Come and join the Asian American Bar Association of the Greater Bay Area, Asian Business League of San Francisco, and Nakayoshi Young Professionals for our 2018 joint hike series on Saturday, June 23rd , in the Presidio, from 10 am to noon. This hike will be led by AABA's John B. Lough, Jr. Be sure to bring your own water, sunglasses or hat, and snacks. Hike will begin at 10 a.m. and last until noon. A no-host lunch at a local restaurant will follow the hike. Place to be determined. AABA, ABL-SF, and Nakayoshi’s 2018 joint hike series will take place in June, July, and August; and will be a fun and informal way to meet new people, network, and explore the beauty of the Bay Area. Park at Baker Beach near Battery Chamberlin sign and fence, at 9:45 am. For more information, please contact John B. Lough, Jr. (lough.law@gmail.com).